Iowa State’s Department of Electrical and Computer Engineering is celebrating Black History Month with a series highlighting alumni, faculty and students. This is the first in a multi-part series. Click here for more Black History Month coverage. It’s hard to imagine Iowa State University’s campus without Parks Library or the Memorial Union in the early 1900s. It’s even harder to imagine what life was like for students at that time. Today, Ames has countless housing options for Iowa State students, both on and off campus. But what if you weren’t allowed to live on campus? What if you had to find alternative housing for yourself because of the color of your skin? For African-American students on campus 100 years ago, these were obstacles to overcome. Iowa State was founded as a land-grant university, which enables the ideals that higher education should be accessible to all. This meant African-American students could attend from the start of the university’s first class in 1869. However, they were not permitted to live in campus housing. Students of color found off-campus living arrangements and attended classes with everyone else. Amidst all the obstacles, Claron “Hutch” Hutchison was able to attend Iowa State College (the university’s name back then) and graduate with an engineering degree. 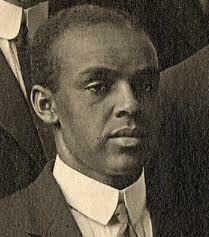 Hutch was the first African-American to graduate from today’s Department of Electrical and Computer Engineering, earning a degree in electrical engineering in 1913. While at Iowa State College, Hutch participated in class football and track, which is the equivalent to club teams today. James H. Banning was another electrical engineering student from the same time period, who left Iowa State to pursue his dream of becoming a pilot in the early 1920s. Banning was the first African-American pilot to complete a transcontinental flight and receive a commercial pilot’s license. During that era, Fred Patterson, who received a Ph.D. from Iowa State in veterinary medicine and went on to found what became the famous Tuskegee Airmen unit of World War II, was living with Banning and five others in off-campus quarters. Since campus housing was restricted to white students, Patterson and other African-American students had to find living arrangements elsewhere, renting quarters above a store in Ames. They dubbed themselves the Interstate Club, with as many as two dozen students living there at any given time. Former ISU President Albert Storms wrote that African-American students“ are entirely welcome at this institution; they have no discourtesy whatever shown them by fellow students or other.” He went on to write that it is not always easy for African-American students to find rooming and boarding accommodations. After World War II, African-American students were able to live on campus at Iowa State. The university has always strived to uphold the values of a land-grant university, that everyone, regardless of the color of your skin has, the opportunity for an equal education.